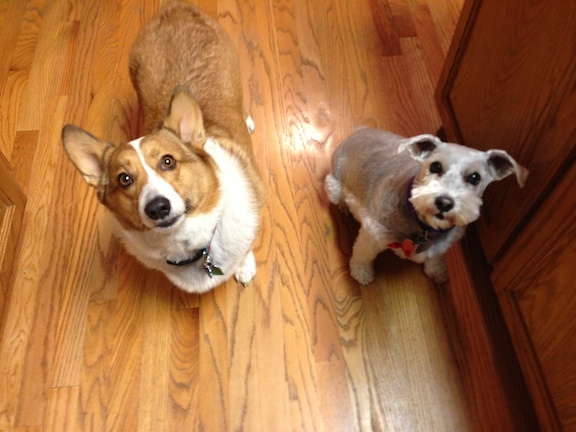 Roscoe (pictured here on the left) is a four-year-old Corgi. The dog was inherited by Roscoe’s former owner’s son after his father passed away. Since joining his new family, Roscoe had shown some behaviors his new family wanted to eliminate; over barking, attempts to dominate the family’s existing dogs, and aggressive behavior when confronted or corrected by his new owners. After discussing the situation a bit, I showed his owners a leadership exercise I use a lot. It teaches the dog to recognize and respect the human’s authority while also helping it learn to focus and build up some impulse control. The exercise involves the human standing over a high value treat or item to “claim” ownership of it. As soon as Roscoe saw the treat, he immediately ran over to gobble it up. Usually when I move forward to communicate that the item is in my area / possession dogs will attempt to circle around or will back off to agree with my ownership. Not Roscoe, He latched onto my boot and gave me a serious bite. Now I wear heavy boots for just this reason, but the intensity of his bite and the associated dominant behavior was concerning for me. Especially since Roscoe’s new home included several children and two smaller non aggressive dogs. As soon as he understood he wasn’t going to get the treat, he changed his demeanor – but he did make some aggressive body language before moving away. Before repeating the exercise, I asked his owner’s to get me his leash. I placed it on him but didn’t hold onto it, letting it drag on the floor. This time when I stood in the claiming position and he made an aggressive movement towards it, i picked up the leash and gave him a correction. As soon as I did his demeanor changed instantly, showing me a respectful distance, avoiding eye contacts and no longer challenging me for the treat. I continued the exercise to its conclusion and practiced it a few additional times before coaching the members of the family through it as well. While there was some residual aggression reactions (snarled teeth), they were minor and immediately halted once the leash was simply picked up. Often a leash can result in a change of behavior and that was certainly the case for Roscoe. By the time all the members of the family finished the exercise, he had completely surrendered and was showing no signs of aggression. I suggested they use the leash when they practiced this exercise and introduce it any time he showed any signs of aggression. In Roscoe’s case, I believe he had learned that acting in an aggressive or dominant manner got him what he wanted from his former owner. While it was mostly an act, he did follow through with a bite, so I advised his family to exercise caution any time they saw any behavior they felt uncomfortable with. Next I showed the family how to claim the front door to the home as the dogs rushed at it barking when anyone arrived. By claiming the space with my movement and moving the dogs away from the door, I was able to communicate a new rule; that when someone was at the door the dogs needed to stay at the end of the hall instead of rushing the door. Roscoe reverted to an aggressive snarl once, but as soon as he saw the leash i was holding he stopped and retreated to where the other dogs were sitting. It will take some practice over the next week or two, but a permanent change should be achievable in a week or two. Next I suggested a few additional rules and boundaries to add to the dog’s lives to help reinforce their follower position. While there rules are minor changes for the humans, they impact the dog’s perception of its place in the pack. And because they are things that will occur several times each day, these minor changes will help the dog see itself in the follower position for the rest of its life. By the end of the session Roscoe was laying calmly on the floor with his pack mates. His aggression issues will take a little time to completely go away, but based on the progress we made in the two hour session, it shouldn’t take too long as long as his family practice the new rules, exercises and promptly disagree with him at the first sign of any additional aggression.